PORTLAND, Ore.–Antimatter is an exotic material that vaporizes when it contacts regular matter. If you hit an antimatter baseball with a bat made of regular matter, it would explode in a burst of light. It is rare to find antimatter on Earth, but it is believed to exist in the furthest reaches of the universe. Amazingly, antimatter can be created out of thin air–scientists can create blasts of matter and antimatter simultaneously using light that is extremely energetic. How do scientists make antimatter? When electrons, negatively charged subatomic particles, move back and forth they give off light. If they move very fast, they give off a lot of light. A great way to make them move back and forth is to blast them with powerful laser pulses. The electrons become almost as fast as light, and they generate beams of gamma-rays (Figure 1). Gamma-rays are like X-rays, such as those at doctor's offices or airport security lines, but are much smaller and have even more energy. The light beam is very sharp, about the thickness of a sewing needle even a few feet away from its source. When gamma-rays made by electrons run into each other, they can create matter-antimatter pairs–an electron and a positron. Now, scientists have developed a new trick to create these matter-antimatter pairs even more efficiently. "We developed an 'optical trap' which keeps the electrons from moving too far after they emit gamma-rays," said Marija Vranic from the University of Lisbon, who will be presenting her work at the American Physical Society Division of Plasma Physics meeting in Portland, Ore. "They get trapped where they can be hit again by the powerful laser pulses. 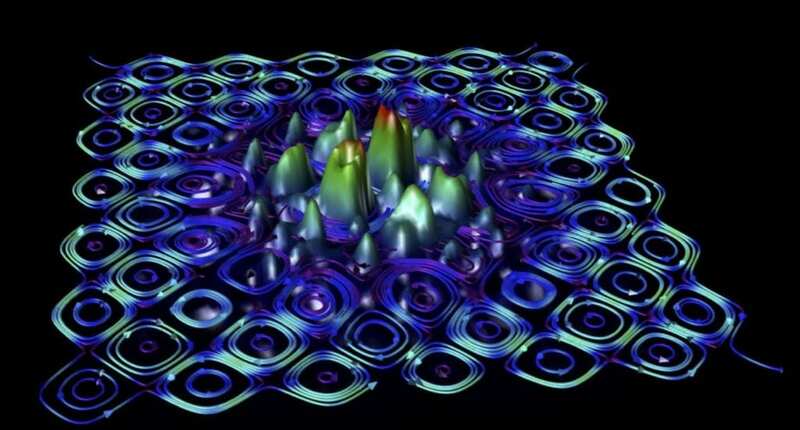 This generates more gamma-rays, which creates even more pairs of particles." This process repeats, and the number of pairs grows very fast in what is called a "cascade." The process continues until the particles that have been created are very dense (Figure 2). Cascades are thought to occur naturally in faraway corners of the universe. For example, rapidly rotating neutron stars called pulsars have extremely strong magnetic fields, a trillion times stronger than the magnetic fields on Earth, that can produce cascades. Studying cascades in the laboratory could shed light on mysteries related to astrophysical plasmas in extreme conditions. These beams can also have industrial and medical applications for non-invasive high-contrast imaging. Further research is necessary to make the sources cheaper and more efficient, so that they can become widely available.